Paul Federico, Creative Director of Princeton Partners speaks with MCCC students at the company's corporate offices. Federico and Aaron Stoker-Ring, Associate Creative Director (seated at computer). 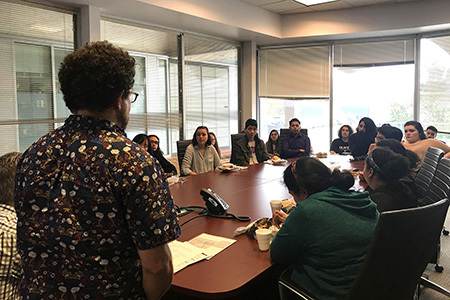 West Windsor, N.J. – Twenty-four students studying Advertising and Graphic Design (ADV) at Mercer County Community College (MCCC) got a taste of the real world during a trip to a busy advertising agency in October. Professor Tina LaPlaca, coordinator of the ADV program, arranged the field trip to Princeton Partners, Inc., a strategic brand marketing agency based in Princeton. The student group included both first- and second-year students from MCCC's Graphic Design Club. 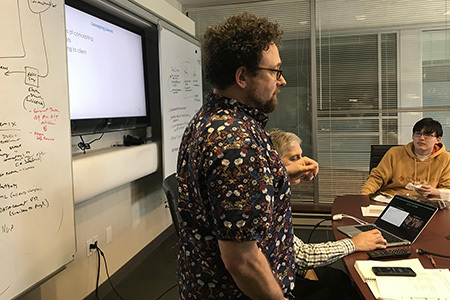 "It's a great experience to take students out of the classroom and give them a broader view of how their learning will be applied in a professional environment," LaPlaca said. "Each of the directors explained their various roles and responsibilities in a comprehensive, informative presentation to our group." Federico observed that the visit was great all around. "I enjoyed meeting the students. It’s good to speak with young designers. The experience is a glimpse into their future. Hopefully, we learn from them and they learn from us," he said. LaPlaca reports that the students were enthusiastic about the trip. "We really appreciate the directors taking the time to share with us. This is the kind of experience that can guide careers," she said. Princeton Partners is currently guiding one such career. They have employed an MCCC ADV alumnus, Momin Rafi, as a graphic design intern. LaPlaca said the agency plans to continue offering internship opportunities for MCCC students.